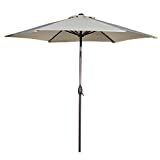 Abba Patio has put together an outstanding offering with their 9′ tilting market umbrella [Amazon Link] [Wayfair Link]. Featuring a high quality, UV protected, waterproof spun polyester canvas that will last 1,000+ hours, and a powder coated aluminum frame, this umbrella is shockingly robust. Add a tilt system and six color options, and this umbrella is a knock out, given its price point. The tilt functionality is great for those late afternoon rays, and the hub and rib design is pretty solid, featuring six steel ribs. This article is an Abba Patio 9′ Market Umbrella Review, and looks closely at all of the details of this market umbrella. Read on and find out if this umbrella is right for your patio. Note: Abba Patio has supplied OutsideModern with one of these umbrellas for review. All of the opinions expressed in this article are wholly our own. 1.1 Who Needs the Abba Patio 9′ Market Umbrella? Patio umbrellas priced under $100 are generally seen as almost disposable outdoor shade devices. They often aren’t built all that well, and have inexpensive canopies that fade quickly, and just don’t look very nice. But that’s not the case for all under $100 patio umbrellas! The Abba Patio 9′ market umbrella, with proper care, appears to be capable of lasting multiple seasons, and providing high quality shade and comfort for quite a while. Abba Patio is one of our favorite outdoor products manufacturers, and they consistently produce high quality outdoor goods with a modern aesthetic, at great price points. Who Needs the Abba Patio 9′ Market Umbrella? Anyone looking for an inexpensive, stylish patio umbrella should check out the Abba Patio 9′ market umbrella. It looks great, has a really high quality canvas, and the mechanisms for use are very simple. The crank works really well, and the tilt function is quite helpful. A nine foot umbrella like this one is capable of shading a round table with 4-6 chairs, roughly. Be sure to check out our guide to patio umbrella sizing for more information to find out if this umbrella will fit your needs. The Abba Patio 9′ market umbrella has a very stylish look, with a high quality antique bronze powder coat over the aluminum frame, and some interesting color options. The one we reviewed has the tan canvas, and it looks excellent. Typically we prefer brighter colors for patio umbrellas, but the overall pairing of the antique bronze frame and the tan canvas is quite balanced. The pole itself looks great, and the stainless steel pop where the tilt button is located is a nice little accent spot. The crank mechanism is a matching color to the umbrella pole and feels fairly solid. The finial on the top is very basic, with just a simple circular design, completing the modern look throughout. The six-rib design is a bit different than the more common eight-rib design and is a bit of step up in style. Do note, if you think you’ll get a replacement umbrella canvas in the future, you may have fewer options with a six-rib umbrella than with an eight-rib umbrella. Given the price point Abba Patio is targeting with this line of umbrellas, the build quality is quite nice. We love that it is covered under a 1-year warranty, which is not that common for umbrellas priced in this range. The frame is made of light weight aluminum, with a nice powder coat that looks great, and appears to be pretty robust. The pole diameter is 1.5″, and is pretty standard. If you’re looking to insert it through a table, you may need a patio umbrella wedge to make that connection secure. The six ribs are made of steel, which is a decent umbrella rib material. Fiberglass would be better (as would eight ribs), but these seem reasonably sturdy, yet flexible. Of course, more ribs will mean a sturdier frame, and higher price, so over time this may become more prone to breakage than an eight rib umbrella, especially if exposed to strong winds. But at least from our examination, the ribs seem to be pretty solid as is. But how about the operation of the umbrella? Everything looks good here too! The crank handle is made of metal, and the mechanism is housed in a plastic casing. It seems sturdy and strong. The crank itself is very easy to use and produces a satisfying click noise as the umbrella opens. When you want to tilt the umbrella, just push the button and down it goes. Push it again to bring it back to straight. Easy to use, and no hassles. The canvas is made of high-quality solution dyed polyester (see here for more information). Sure, it’s not a Sunbrella umbrella, but it doesn’t cost anything near to what a Solution-Dyed Acrylic umbrella costs, either! The canvas here is made of recycled solution-dyed polyester, and is UV protected for up to 1,000 hours! It’s also functionally waterproof, which is pretty unusual for a patio umbrella. That said, it’s always wise to cover your umbrella with a patio umbrella cover when it’s not in use. The cover will greatly increase the useful life of the umbrella canopy. This umbrella does not include a cover, but it does have a Velcro strap to help hold everything together when it’s time to close up for the evening. Given the price point this umbrella hits, the build-out is very nice indeed! When the sun gets low in the sky, often a tilt functionality will help keep the sun out of everyone’s eyes and help keep people cool in that late afternoon sun. Fortunately, tilting this umbrella is incredibly simple. About 2/3 up the umbrella shaft is a tilt button. Upon pressing the button, the shaft tilts about 45′ in two directions. There is only one level of tilt (other than straight up), but overall the system works great. Some reviewers have noted some difficulty in getting the button to work, but in our case, it was very simple and required very little effort. If the button is stuck, you may need to spray it with some WD-40 or similar in order to get it to move in and out a bit. One note, that is not included in the instructions: be sure not to close up the umbrella while it’s in the tilt setting, as this can damage the interior mechanisms and render the umbrella non-functional. If you’ve ever had a patio umbrella sail away on a windy day, or (even worse) cause a table to flip over due to a gust, you know that finding the right weight for your patio umbrella is a must. This umbrella comes with a single wind vent at the top of the umbrella, which is pretty standard for these designs. The single wind vent works fine. Depending on if you’re going to use this umbrella in conjunction with a table or not, your weight needs will vary a bit. See our patio umbrella weight guide for more information. For this umbrella, ideally, a 50 lb base weight without a table should cover you. If you’re going to tie it to a table as well, you could probably get by with a 40lb weight. The process of getting this umbrella going is very simple, and the screw on design is definitely easier to deal with than the push button locking mechanisms so commonly found on patio umbrellas. The instructions are competently made, and you’ll likely only need to glance at them once. Abba Patio has got a hit on its hands with this stylish, thoughtfully-made patio umbrella! Given the price point where Abba Patio has positioned this umbrella line, the build-out is excellent, the design high quality, and the one year warranty a nice bonus. The overall offering is outstanding. If you are looking for a nice tilting patio umbrella that doesn’t cost a lot, it’s hard to find a higher quality 9′ patio umbrella at the price point Abba Patio is targeting. Also, be sure to check the price on Wayfair before buying, as well!